GRAFENWOEHR, Germany — Dozens of kindergarten and first grade students, along with their parents and school staff, participated in the 2nd Annual St. Martin’s Day Lantern Walk Nov. 2, 2017 at Netzaberg Elementary School. On Tue, Nov. 7, the Netzaberg School complex was lit up with hundreds of lanterns carried by children with beaming smiles. The lantern walk is a German tradition which celebrates the generosity and kindness of St. Martin of Tours, a regionally-celebrated Christian saint. He is now recognized as the patron saint of soldiers, homeless people and pets. Two students started off the evening with a brilliant performance using their trumpet and saxophone. Shortly after, three students from first and second grade read the story of Martin and performed a play, where Soldier Martin of Tours shared his cape with a poor person who was cold and neglected. 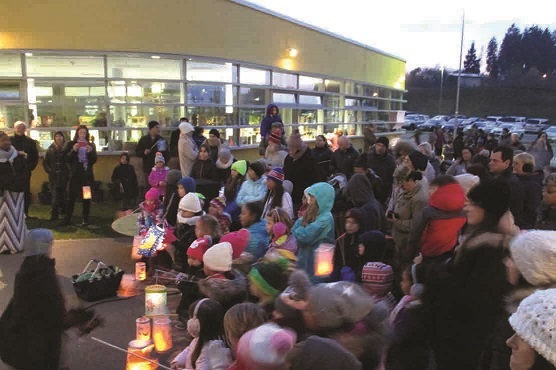 After a speech from Netzaberg Elementary School Principal Vanessa Faerber, the families paraded along the school grounds and sang typical lantern walk songs. To warm up after the cold walk, children and their parents received Lebkuchen and Kinderpunsch, generously distributed by Kindergarten teachers. This event is just one of many German traditions brought into the daily life of Netzaberg Elementary School’s students. German traditions are actually tied into their curriculum.